A Yorkshire yachtsman has been found alive and well on his yacht 80 miles off the Yorkshire coast. A yachtsman from Yorkshire, reported missing yesterday (Thursday 10 July 2014), has been found on his yacht in the North Sea, following an extensive search coordinated by Humber Coastguard. His 17ft yacht, Equinox, was approximately 80 miles east of Spurn Point (at the mouth of the Humber) and rescuers found him relatively quickly today, thanks to an emergency positioning beacon aboard his yacht which was activated. The 69-year-old’s family contacted the Coastguard on Thursday as they had become concerned for his safety. They had not heard from him since 4 July when he telephoned his son to tell him he was planning his passage home. His boat was last seen in the Kiel Canal, at Brunsbuttel, Germany. A police investigation revealed that the missing man had not used his bank cards since 3 July, leading Coastguards to assume that he was at sea. Humber Coastguard initiated the search and rescue helicopter from RAF Leconfield to make a wide sweep of the area from Scarborough to the median line in the middle of the North Sea. Germany counterparts carried out a similar search from Helgoland. A general alert to French, Belgian, Dutch authorities and shipping was put out, and Humberside Police logged a missing person’s alert with Interpol. Humber Coastguard last night also appealed to the yachtsman directly following the BBC shipping forecast to urgently make contact and inform the Coastguard of his safety and intentions. We are all absolutely delighted that this gentleman has been found alive and well. It is thanks to an excellent effort by all those involved in the search and rescue and is a testament to the value of emergency beacon equipment. It is important that yachtsmen planning this sort of passage have adequate communications and log a passage plan with a shore contact. 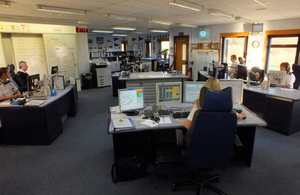 The more information that is available to us here at the Coastguard, the more concentrated we can make our search efforts. Outside these hours, for emergency press enquiries only please dial the above number. You will hear a message giving an out of hours pager number.